Last weekend I finally bit the bullet and made time to take blog photos. Things have been all over the shop around here lately and trying to squish in blog photo time in the middle of winter has been a challenge. Our new house is amazing but rather compact so trying to find a space where a camera and tripod will fit and you can see more than my knees has required some serious trial and error. Nevertheless, when you make something super cute AND super snug you need to share it with the world. Brace yourselves people – things are about to get a bit velvety! This slinky number is the Appleton Dress from Cashmerette. 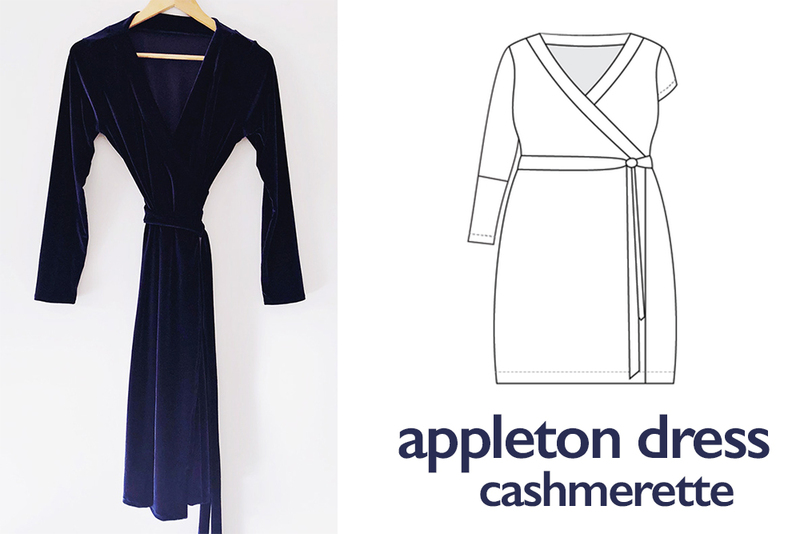 The Appleton is a wrap dress with a V-neck crossover front, a wrap tie and options for cap, 3/4 and long sleeves. This was the debut Cashmerette pattern, and whilst I have eyed it off for ages I haven’t felt like there has been an occasion to rock it out. In saying that, I can never say no to sale so snaffled it up on discount late last year and waited for the perfect event. So, when a fabulous winter wedding invitation came it was time to pounce! Real talk: this fabric is crazy lush! It’s a beautiful sapphire blue stretch velvet from the fine folks at Pitt Trading. Whilst I like to keep my stash small and sassy, this has been chilling in there for over a year. As part of the Canberra Sewing Crew road trip contingent to Sydney Frocktails last year, we made a pit stop at Pitt Trading (unintentional pun = win!) and with the help of the lovely Susan found some ace fabric and notions and made some fabulous purchases. 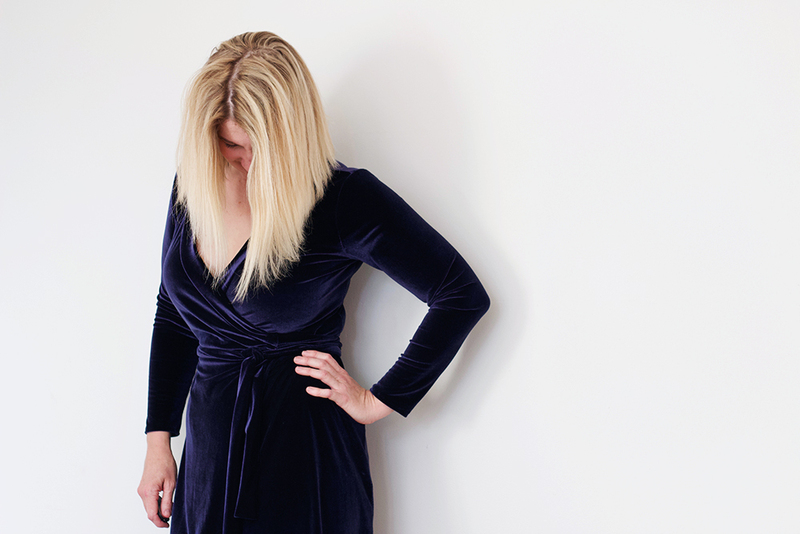 I have to say this velvet impresses me – it’s got a great stretch and recovery and the colour is a rich blue. But the best bit? It never ever seems to crease or wrinkle. These photos were taken after the dress had been sitting crumpled at the back of my wardrobe for three weeks because it fell off a hanger and I didn’t notice. Epic wash and wear? Best. Thing. Ever. My greatest challenge was actually from sewing the velvet. Now, I did some research about cutting stretch velvet (cutting on the flat is your friend) but for some reason didn’t think to look into how to sew. My first attempt at a seam was horrific and wobbly. After a call for help on Instagram, I popped my walking foot on, slowed down and used a zig-zag stitch. Simple things but they made great results. Further to that, I avoided doing any top stitching and instead used the blind stretch hem stitch on Primrose (my loaner from Janome) and it worked like a dream. I also made sure to use steam and a pressing mitt to press and avoided any direct heat. Winning at steam! No gape neckband. I took the shimmy challenge and danced the night away and everything stayed snug in place. How quick it was. Nothing like deciding a few days out from an event to make something new. Once I got going and popped the walking foot on this came together crazy fast! Soften my grading line between waist and hip. I cut things on the fly and feel like this made the frock bubble a little at the top of my thigh. Slow down, Manda! Overall, I freaking love this dress! It feels so luxurious on and it held up to a night of laughter and dancing well. And I won’t lie – the ability for something to stay crumpled for a few weeks and look good as new when you pull it off the floor is A+ to me. This lady is all about the wash and wear and that ironing time dancing instead! Smashing! Which is not something I say in real life but this prompted it, so there. Smashing. Ooh this is just the thing I had in mind for a (cold) Christmas dress in a red stretch velvet I also got from Pitt Trading. Unfortunately I don’t have the bust or waist for Cashmerette patterns so am on the hunt for an alternative otherwise it will be the Jonie dress. Thanks for the sewing tips. I’ve never sewn with velvet before and am frankly a bit scared of the challenge , despite having an awesome new Pfaff to play with. Ohh the red is so lovely as well! I super suggest doing some test sews before you begin! Also, the velvet smooshes into each other when it is right side to right side meaning no pins! That color is gorgeous and the velvet looks so luxurious. Well done. Thank you!!! I am beyond stoked with how this turned out! Thank you! 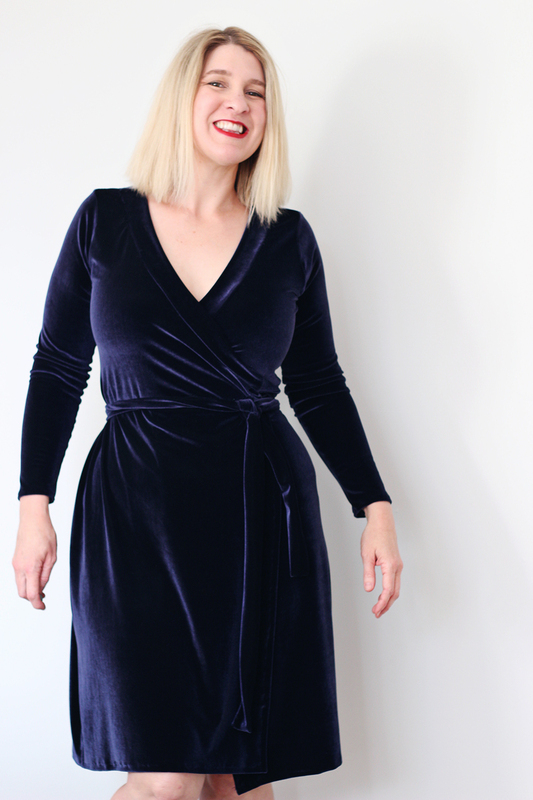 I am completely smitten with this frock – it’s so dang cool! This is luscious!! Is that a gross word? I can’t decide. Anyway, it’s beautiful! Bwah ha ha! I shall take it as a compliment! It is such a delight to wear and the fabric is a dream!